Mythology is money these days. My son is obsessed. 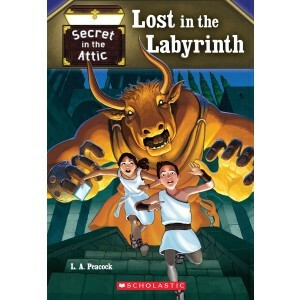 In fact he'll flip when he sees that Minotaur! And a labyrinth! When do these come out? I like it when you mix your actual 'work' along with your 'play' here on your blog. Hope to see more. The series looks like alot of fun! great job on the cover. The first two are already out, but they seem to be available only through the Scholastic book club. I think you can buy used copies through Amazon. To be completely fair, the scene on the cover doesn't play out in the book. They do see something that looks like a minotaur from a distance. The books are historical, not fantasy. The covers are fantasy--that's for sure.